The inevitable lengthy post for WonderCon 2018 is right here. From the travels to the food to the event itself. So many happenings that all the article layouts I came up with didn't really make sense, but the organizational tools Squarespace provides for an article allows me to jam this into one post. Breaking down the post into sections for WonderCon, cosplay, travel, and hotel seems good! Let's go. Coming down to Anaheim is always a fun getaway. I think mailing out badges is a super big advantage for those that pre-register regardless of badge type. WonderCon brought back the badge scanning entrances, which is something every event bringing in thousands of attendees should utilize. 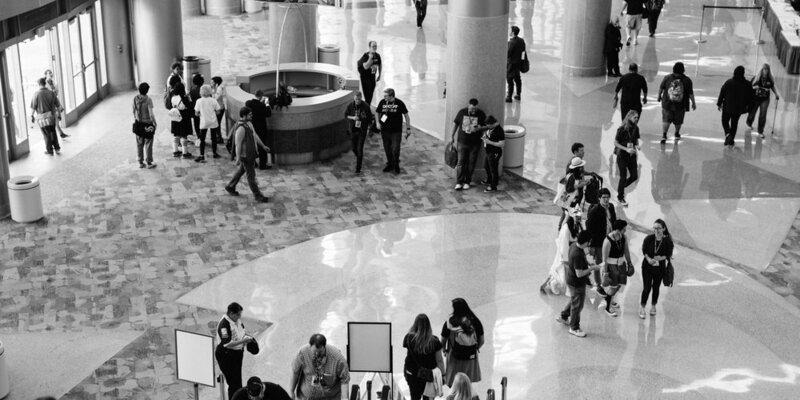 The exhibit hall layout was identical to last year, which made navigating a little easier. Most of the larger / popular booths were positioned either at the front or back of the halls. DC Comics, IDW, and BOOM! Studios kept the front busy for comic fans. Towards the back was a promo booth for Rampage (film) with large screens for people to play the game the film is based on. The crowd at WonderCon is so upbeat. There isn't really some mad dash morning exclusive release that people have to get every day. This is still an event that you can walk up to at it's 10am opening and enter without any problems. That's probably why I like being at WonderCon; super chill times to be had. Weather was fantastic, so staying outside on the balconies or fountain areas made great for breather breaks if the exhibit hall was crowded. Food trucks galore were just outside the badge scanning area for the hungry folks refusing to pay convention center food prices. It's known that cosplay photography is a staple for content here, so of course I went to town taking pictures of cosplayers throughout the weekend. The creativity down there is insane, but I love every bit of it for photography. I think being out-of-town press is nice since it lets me see people that I haven't shot before or not as much. Galleries for each day will have their own link here. I'll update this list with links as they are completed! Flying from Sacramento to Santa Ana is probably the easiest way to southern California, especially knowing most of the time will be spent in Anaheim. This is my go-to mode of transportation. These airports are easy-going for everything, plus they both have Starbucks. I flew Southwest round-trip. My friend Josh was on the flight there, but I flew home solo. Stayed at the Sheraton Garden Grove. Like the airports, this is my go-to hotel for stays in Anaheim. The combined SPG perks and club level food & drinks provide incredible value. I can't imagine how extra money would have went towards food & drink if there wasn't breakfast and afternoon appetizers. First big event using the Sony AX53 camcorder for video content. I think another event or two will get me completely acquainted with it. It isn't exactly pocketable or compact at all, which made me not record as much throughout the day. Balancing photo and video work is still a big challenge for me though. Some footage on Sunday was shot with the iPhone 6s since I didn't bring the AX53 in my evening pack for Downtown Disney.